The first days after delivery are crucial for breastfeeding and milk production establishment. For current and prolong milk supply. MyMilk scan give you an objective monitoring tool to track mother’s individual lactogenesis II process. Early. Even before appearant symptoms. Early monitoring of breastfeeding establishment, enhance in-time intervention for individuals at risk, thereby supporting prolonged breastfeeding success and reducing immediate low milk intake complications in the infant (low weight gain, dehydration & jaundice). Breastfeeding monitoring tool, For better breastfeeding establishment support. All at your professional hands, supporting immediate, individual, evidence-based decision making. SCAN mother individual breastmilk via MyMilk scanner, starting at the first days after delivery, and get an immediate feedback on breast milk establishment process. As early as the first days. 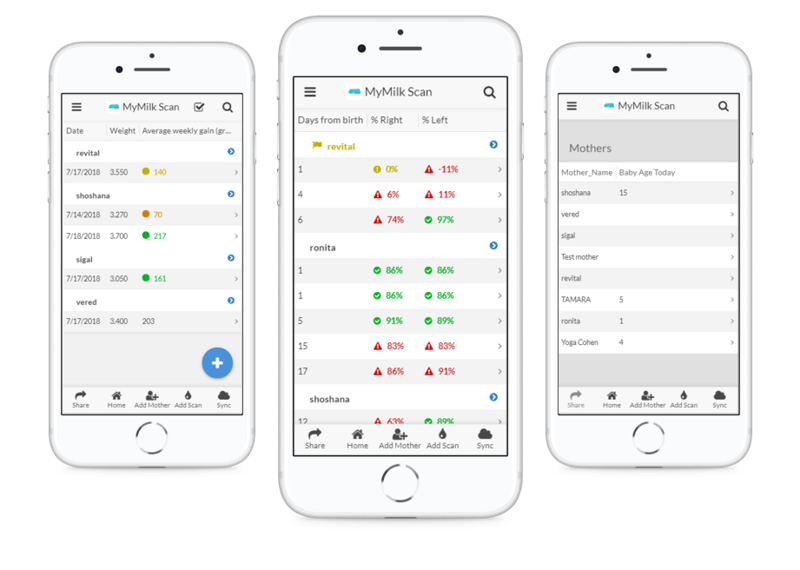 Get personal insights and a color coded alerts, on mother breastfeeding establishment progress and baby weight gain, based on mymilk algorithms. Hand held patent pending on-the-spot scanner for tracking breast milk maturation process via a tiny breast milk sample. 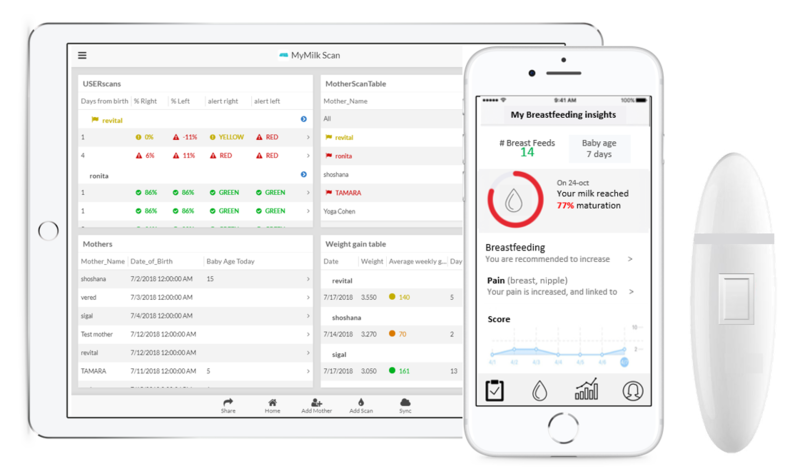 Manage Breastfeeding establishment records, for tracking individual mom’s breastfeeding and milk production data, and getting immediate evidence-based insights and alerts via mymilk AI system. Available as a free beta for Lactation consultants. you scan a tiny sample of mother breast milk (each breast separately) via MyMilk scanner, starting at the first days after delivery. Get instant results for your scan or weight test, via your MyMilkScan App for lactation consultants. Monitor every mother you help in the first 3 week. Monitor individual mom’s lactogenesis process via mymilk scan. Get instant feedback and alerts, based on a unique AI, accounting to the specific day from birth and mother individual records. Track baby weight gain, weight velocity, and test weighing. Get immediate insights and color-coded alerts. Track dynamics, manage records, and see trends. Manage mother OB/GYN health records, baby weight gain, and scans. Track risk factors associated with breast milk production. A professional dashboard, alerts, and insights for quick identification of mothers’ breastfeeding records and alerts (lactogenesisII & weight gain), for early and in-time breastfeeding establishment support.